Penn was founded on unique grounds in the history of education. 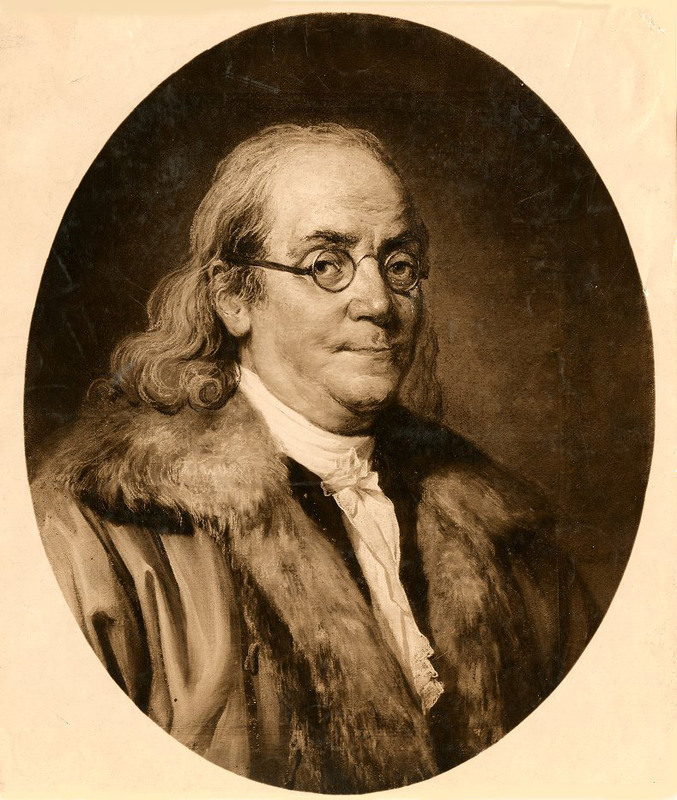 In Philadelphia Benjamin Franklin sought not only to create a local institution of higher learning, but also to provide an education that did not fit the models already established in New England and Virginia. In Europe and the colonies up to that time, such schools had emphasized the training of new clergymen. The goal of Franklin’s nonsectarian, practical plan would be the education of a business and governing class rather than of clergymen. His ideas found a receptive audience in the prominent men of Philadelphia, who saw a need to prepare young men to lead the government and businesses of their growing city, the largest in the American colonies. 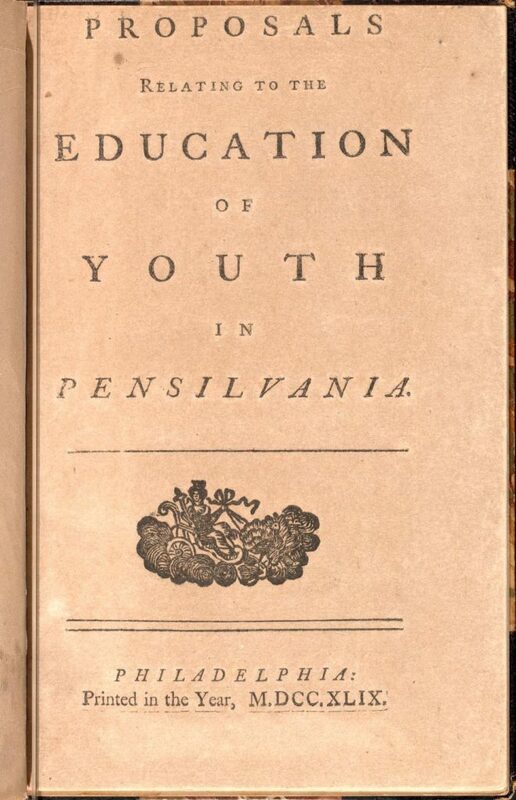 Franklin articulated his educational vision for the Academy and College of Philadelphia in his 1749 essay, Proposals Relating to the Education of Youth in Pennsilvania. Classes in his proposed schools were to be taught in English rather than in Greek and Latin, and the curriculum would include useful subjects such as natural history, geology, geography and modern languages. Although Franklin’s vision would be tempered by Provost William Smith‘s dedication to classical languages and by the large number of Anglican trustees in the 1760’s and 1770’s, his ideas were important in shaping Penn as a unique institution. Franklin’s concept of higher education was new in the mid-18th-century western world, but is what a liberal education has now become. 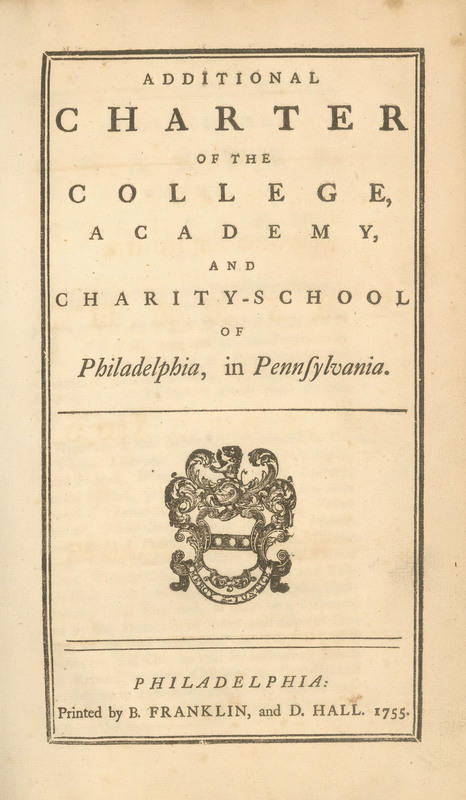 Unlike many other colonial American colleges, at Penn, the College was preceded by two schools aimed at younger students, the Academy and the Charity School. The three schools were part of the same institution and were overseen by the same board of Trustees. The Trustees’ Minutes give a firsthand account of how Franklin’s vision played out in these three institutions during the first fifty years of Penn’s existence. 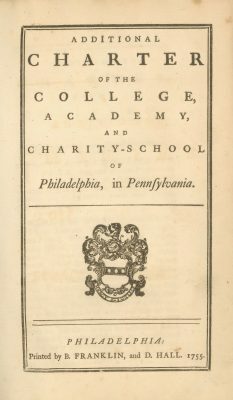 The first concrete manifestations of Franklin’s plan were the Academy and Charity School of Philadelphia (as laid out in the 1749 constitution). These two schools opened in 1751 and two years later were granted a charter from the proprietors Thomas and Richard Penn. In a few years the Academy had been successful in producing suitably educated young men interested in pursuing an even higher level of formal education leading to a degree. Thus, in 1755 Ben Franklin and his board of trustees secured a charter for the College of Philadelphia, to be led by Provost William Smith. The Class of 1757 was the first class to graduate from the College. Penn became a university by definition before it became a university in name. The sequence of events leading to the creation of the “University of Pennsylvania” is described below. With the 1765 founding of the first American medical school, Penn became America’s first university since the institution now consisted of two departments or schools: the collegiate and the medical. Penn did not, however, use the word “university” in its name until the Revolutionary era, when in 1779 the old proprietary charter was replaced by a charter granted by the new state government. The university’s official name then became the University of the State of Pennsylvania. Since the Revolutionary state legislature felt that the board of trustees led by Provost Smith contained too many suspected loyalist sympathizers, they created a new board of trustees. Provost Smith and the remnants of the old board of trustees of the College persisted in their efforts to regain control over College property. Finally in 1789, the Pennsylvania legislature reinstated the original charters of 1753 and 1755. This led to the existence of two institutions of higher learning and two campuses: Dr. Smith’s College occupied the original buildings at Fourth and Arch Streets, while the University of the State of Pennsylvania moved its classes to the Philosophical Society Hall at Fifth Street near Chestnut Street. This situation, however, produced serious administrative and financial problems for both institutions. A solution came about when Pennsylvania adopted a new state constitution in 1791. At that time a new charter joined the College of Philadelphia with the University of the State of Pennsylvania to form the University of Pennsylvania. The two institutions were joined, each choosing twelve men to serve on the newly constituted board of trustees. It is this institution and this board of trustees that has continued to this day. What we now know as the University of Pennsylvania was created by the constitution, charters and legislative acts of the eighteenth century, beginning with the charity schools and the academy, then the college, then the medical school and eventually a university in two different manifestations. And as the institutional mandate evolved so did the organization, curriculum and faculty of the component pieces. It was up to the trustees and faculty to give form and content to these legal mandates; and the organization, curriculum and faculty that followed the 1791 union of the University of the State of Pennsylvania with the College of Philadelphia was not what the same as what had existed in the 1750’s – and certainly not what would exist in the future. Curriculum and faculty are constantly evolving. Caitlin A. Doolittle. “Preliminary Research Report of the Penn Slavery Project.” Paper prepared for Penn Slavery Project under the direction Professor Kathleen M. Brown, Department of History, University of Pennsylvania, Philadelphia, December 2017. VanJessica J. Gladney. “Penn Slavery Project Research Report.” Paper prepared for Penn Slavery Project under the direction Professor Kathleen M. Brown, Department of History, University of Pennsylvania, Philadelphia, December 2017. Dillon J. Kersh. “Penn Slavery Project Preliminary Research Report.” Paper prepared for Penn Slavery Project under the direction Professor Kathleen M. Brown, Department of History, University of Pennsylvania, Philadelphia, December 2017. Brooke Krancer. “Penn Slavery Project Report.” Paper prepared for Penn Slavery Project under the direction Professor Kathleen M. Brown, Department of History, University of Pennsylvania, Philadelphia, November 2017. Caitlin A. Doolittle, VanJessica J. Gladney, Dillon J. Kersh, Brooke Krancer, and Matthew Palczynski. “Preliminary Findings of the Penn Slavery Project.” Presented at the Museum of the American Revolution, Philadelphia, PA, December 2017. Clay Scott Graubard, BA 2019, U of P. “Documenting the University of Pennsylvania’s Connection to Slavery.” Independent research project. Philadelphia, PA, Spring 2018. Additional research and reports can be found on the Penn and Slavery Project website.